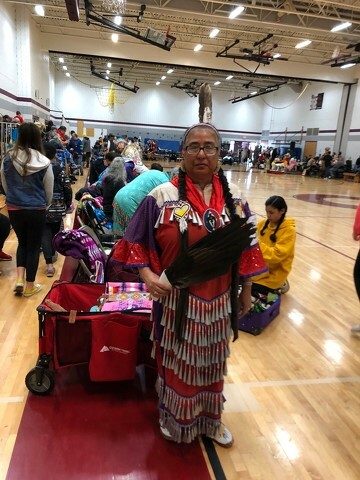 Mataya Horn from Keshena, Wisc., was one of several Native Americans who traveled a long way to attend the annual Penn State Powwow. She is a member of the Menominee tribe. STATE COLLEGE — Penn State hosted the 15th Annual Traditional American Indian Powwow on April 6-7. The Powwow was held at the Mount Nittany Middle School, 656 Brandywine Drive, State College. The first Penn State Powwow was held in conjunction with the 30th anniversary of the American Indian Leadership Program, on March 31, 2001. The celebration included an academic symposium and a four-hour Saturday evening powwow. The powwow had one drum (several voice singers), about 24 dancers and a few vendors. By 2004, after securing sponsors and a larger venue — it was first held at Dean’s Hall at the Penn Stater Conference Center and Hotel — the powwow became an annual event. 2019 marks the 15th year of the event, which has grown to become one of the finest traditional powwows in the East with more than 150 dancers each year as well as four or more drums and 25 or more vendors. A drum refers to both the instrument and to the group that gathers around the drums to sing and enjoy the drumming. Many drum groups are made up of family members. On April 6, the crowd waited with an air of excitement for the opening ceremonies. The Penn State Powwow follows the Northern Plains Traditional style. Powwow coordinator John Sanchez had the festivities well under control as the dancer lined up to enter the arena. Veterans are honored at the beginning of the powwow. In 2010, World War II vets were honored. In 2014 and 2016, the head veteran dancer was a woman — Robin Bowen, a U.S. Army Desert Storm veteran. The powwow also honors its high school and college graduates. Fewer than 10 percent of Native Americans go to college, so it is important to celebrate those graduates. It is educational to experience the powwow to learn about the history of native peoples and to mingle and get to know them. The community has responded in the past by holding book drives, such as one in 2010 which collected books for the Takini Indian School Library, on the Cheyenne River Reservation in South Dakota. Some of the dancers, storytellers and drums have held professional development workshops with local teachers and students in elementary and middle school grades. As the crowd waited for the dancers of all ages to begin, it watched the older women putting finishing touches on the younger female dancers — even a baby in her mother’s arms. Mataya Horn is from the Menominee tribe and lives in Keshena, Wisconsin—about seventeen miles north of Green Bay. The powwow, called a “celebration of life,” by Sanchez in the opening remarks, looked to be exactly that as the men, women and children whirled and danced to the rhythm of the drums. Sanchez said they dance for the celebration and in recognition of their ancestral land. As many as 6,000 people attend the Penn State Powwow each year.